Born and raised in Central Mississippi, Dominic spent the majority of his childhood chasing bass and crappie in the lakes and ponds near his home. He started fishing the White River at about age 12 when his parents bought property around Sylamore Creek and started vacationing here. At about age 15 he bought his first fly rod at a shop in Oxford, MS and taught himself to cast in the pond behind his parents house. That's where his passion for fly fishing began. He moved West to Steamboat Springs, CO at age 24 and spent so much time fishing the Yampa, the Poudre, and the South Platte Rivers that his college career was affected. Negatively. 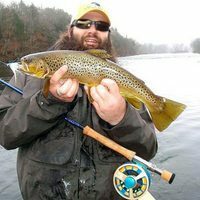 After a hiatus of a few years, he picked up a fly rod again in 2009 and had an epiphany. He decided that unless he was able to somehow find a way to spend his life on the river, true happiness would never be achieved. Being a Southern boy and an avid outdoorsman all his life, fishing is in his blood. Dominic attended Donn Dale's Clark Fork River Outfitters Guide Training School in St. Regis, MT in July of 2012 and is now living his dream!